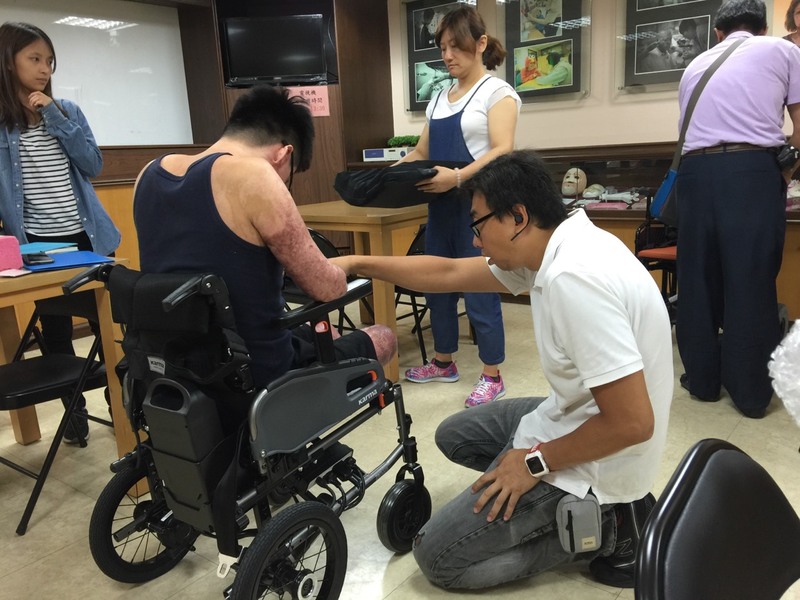 My name is Po-Wei Huang from Taiwan, and I’d like to share my story with you. 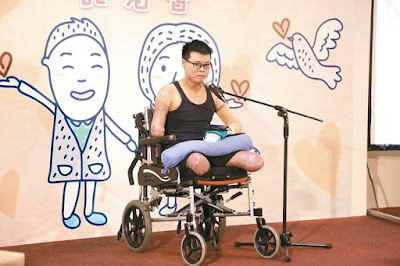 I lost both of my legs and right hand due to a serious explosion accident on June 27th of last year, and the remain left hand was also severely injured. I miraculously survived under numerous times of surgeries and was finally discharged from the hospital. I gradually restored some body movements after many difficult and painful rehabilitation courses, and was able to handle things in daily life by using a manual wheelchair with help from family members and social workers. Soon I started to imagine the days that I’d be able to handle things by myself with limited assistance from others, which is why I started to seek for a suitable power wheelchair. My first test-ride of power wheelchair was a rental from Karma, and I was really impressed by its comfortability and stability. The joyful feeling of moving around on my own again was indescribable, and I never wanted to get off from it until the last minute of its return time. Therefore I’ve decided to purchase a power wheelchair, and started to try out different brands of power wheelchair. Lightweight wheelchair is my first priority owing to living space limitation. I’ve tried many different brands and hope to find the most suitable one, but I soon found out during the early trial period that maintaining my body balance is the most challenging part due to my body gravity is differed from normal people since I’ve lost my legs, and this serious problem could lead to a dangerous and deadly fall. Other wheelchair companies had attempted to increase the front-end weight by securing with sandbags but did not succeed. Fortunately, Karma’s professional customized design team is capable of fixing this problem, which is why I decided to choose a power wheelchair from Karma. The model I’ve chose is called “eFlexx”, which is a newly launched lightweight power wheelchair by Karma in 2016. “eFlexx” is characterized by lightweight, foldable and ellipse-shaped frame design, carried lithium battery is light and easy to disassemble. This battery can be simply removed from chassis to refill the energy without moving the wheelchair to socket. The custom-made service has significantly improved the gravity issue by lengthening chair body, the R&D team also adjusted the armrest and backrest, changed the power controller to the left hand side for me. Every adjustment of this wheelchair fulfills my need, and it is indeed a wonderful “custom made” experience. Thanks to Karma for making me feel safe with my first power wheelchair, and I know I’ll always be supported by the whole Karma crew and can always rely on them.